New to preserving or canning? Follow our step by step guide and you will soon be stocking up your cupboards with scrumptious strawberry jam and other delectable delights! Sterilizing your Kilner® jars and bottles is an important process in preserving and canning. Find out the two methods of sterilizing here by clicking on each step one by one. Essential for the preserving and canning process, Sterilizing Jam Jars is required to remove all bacteria, yeasts, fungi and organisms from the jar so that when you use it for preserving, the food will remain fresh within the vacuum. There are two methods you can use for sterilizing Kilner® Clip Top jam jars, bottles, Kilner® preserve jars, lids and seals and it is up to you which method you choose but we recommend the water bath method as the most suitable. The first process of sterilization, regardless of which method you choose, is to check the jars or bottles thoroughly for damage such as cracks, breaks, and chips. If you find any of your jars or bottles are damaged you must discard them. Now follow one of the 2 sterilization methods below. It is important that you only sterilize your jars, bottles and lids or seals a short time before you are ready to fill them to ensure they remain warm for the filling process. Remove the lids or rubber seals from your jars and put to one side. 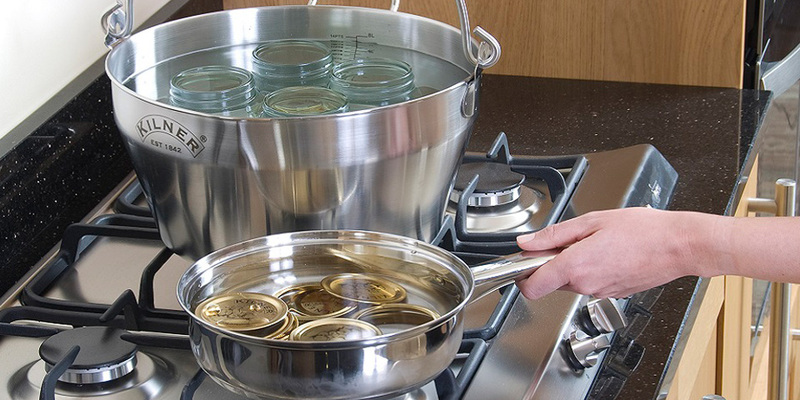 Next place the jars into a Kilner® preserving pan and fill with water until the jars are covered. Bring to the boil and keep at the maximum temperature for 10 minutes, turn the heat off and cover the pan to keep the jars warm until you are ready to fill them. Place vacuum seal lids or rubber seals in a small pan and fill with 4 inches of water, heat and simmer at 180°F for 10 minutes, turn the heat off and cover the pan until you are ready to seal the jars. Remove the lids or rubber seals from your jars and place everything into the top rack of your dishwasher and run it on a hot wash. No detergent or cleaning solutions should be used. Time your dishwasher cycle to finish just as you are ready to fill the jars or leave the jars and lids or seals inside the dishwasher to keep warm until you are ready to fill them. Finally wipe the rim and threads of the jar to remove any food debris. Important: do not attempt to sterilize your Kilner® bottles and jars by pouring boiling water into them. Always take care when sterilizing jam jars and handling hot jars and lids, please use the appropriate equipment such as Kilner® Jam Jar Tongs or oven gloves. Do not sterilize your jars using the oven method as ovens can harbour bacteria from food that is stuck on the oven. A conventional oven with a fan will circulate bacteria.